Bet Jets under 22.5 points with 888Sport. Bet Vikings -3 over the Jets with Karamba. Bet Vikings over 2.5 TDs with 888Sport. The Jets are looking for their third straight win entering Sunday, hosting a Vikings team hungry to extend their own winning streak. It’s rare a team will trade FG for TD, but when your kicker sets a franchise record, you may find the exception. Jason Myers was the story, kicking seven field goals, as the Jets got by the Colts 42-34. 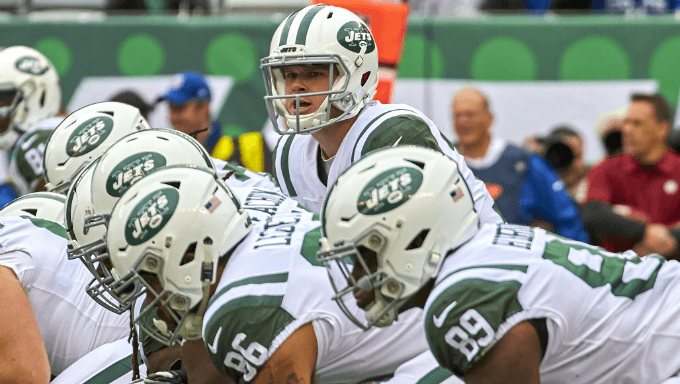 Sam Darnold threw for 280 yards and two TDS with just one interception, as the offense was able to put up points. They have gone over 30 points for two straight weeks. The defense was unable to limit some big plays by Andrew Luck – 4 TDs – which raises concerns this Sunday. The Jets are dealing with a Vikings offense that is setting records with Adam Thielen. As for New York, its leading receiver Quincy Enuwa, could be out with an ankle injury. Like the Jets, the Vikings enter Sunday anticipating their third straight victory. They cruised by the Cardinals 27-17 last week. It’s been an up-and-down season for Minnesota, with serious flashes of greatness from Thielen. However, the line’s inability to protect Kirk Cousins, and their defense not looking anywhere near as strong as last year, have been key factors in their slow start. Cousins wasn’t dominant last weekend against Arizona, just 233 yards, one TD and one interception, but his main target was unstoppable. Thielen blew up for 123 yards off 11 catches, one of them a TD. Latavius Murray paced the ground game with 155 yards and a score. If the offense can continue to get balanced efforts like the last two weeks, it will be a struggle all day for the Jets. The Jets are hoping to get back their top two CBs in Buster Skrine and Trumaine Johnson. Both are questionable, as Skrine was dealing with a concussion and Johnson is trying to play through a quad injury. The biggest issue right now for New York could be their receivers. It looks like only three will be truly healthy on Sunday, as Enuwa is dealing with an ankle injury, Terrelle Pryor a groin injury and Charone Peake could miss time with a bad hamstring. Here’s something to watch for - defensive coordinator Kacy Rodgers returns after a 10-day absence. Rodgers was dealing with an undisclosed health issue. The Vikings are hoping they will have the services of starting tackle Riley Reiff on Sunday, although he is listed as questionable. As is starting strong safety Andrew Sendejo, a major piece in limiting the Jets passing game as well as the ground game. Rookie CB Mike Hughes was placed on the IR, out for the season after a torn ACL. While Murray ran all over Arizona last week, he’d like some help this week. That should come in the form of Dalvin Cook, but he’s questionable for now. Cook is most likely a gametime decision Sunday. The Jets enter this game as a three-point underdog, per Karamba. The slow start to the season for Minnesota could be attributed to two things, their defense was awful and a one-dimensional offense. While it’s only been two straight games, the Vikings look like they fixed those issues. They still keep teams under 100 rushing ypg (93.0) and the Jets came down to earth last week on the ground. A third of the Jets 107 yards rushing last week came from two long runs. Minnesota is only giving up an average of 19 ppg the last two weeks, and Sam Darnold is throwing to injured receivers. Regardless of how Kirk Cousins looks, one consistency in wins is Thielen equals big plays. Too many injuries in the Jets secondary to bank anything on NY this week. Take the Vikings -3 with Karamba. 888Sport has this set at 22.5, and there are just too many factors working against the Jets hitting over this number. Some are internal, some are their opponent hitting a stride on defense. Darnold has been good to great at times, but he’s not dominating games either. He’s only thrown for over 200 yards once in the last four weeks, coming this past weekend against the Colts. Darnold is also throwing to a WR position dealing with a multitude of injuries, a couple that may keep key players out against the Vikings. Add the Vikings defense starting to show signs of last year’s dominance, and you have a very difficult uphill battle for the Jets offense. Bet the Jets under 22.5 points with 888Sport. The line of 2.5 seems too easy when you first glance at it, but the Jets haven’t necessarily been pushovers on defense. Only two times this year has a team gone over 21 points against NY, including losses. The issue for the Jets is neither of those two teams – JAX & IND – have anywhere near the firepower that the Vikings bring. While the majority of the discussion will be on Cousins connecting to Thielen, Murray and Cook will be the difference in this number going over. Cousins hit two TDs on his own in two of the last three weeks, and the Jets are simply not healthy in their secondary. Back Vikings over 2.5 TDs with 888Sport.